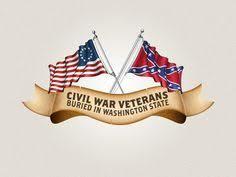 Bruce Smith and Karyn Zielasko Weingarden are the originators of the website www.civilwarvetswastate.com which they hope and expect to become the “One-Stop-Shopping” for those researching a Civil War veteran who came to the Pacific Northwest and died and is buried in Washington state. Did you know about this website? Ever looked at it? Suggest you do so! Their goal with this project is to have, in one place, a complete listing of all Civil War vets resting in Washington soil along with a bit of a biography on him. These bios are gleaned from official records or submitted by researchers. So what does this mean for you? Do you have a Civil War veteran ancestor buried here? Is he documented on Bruce and Karyn’s website? Would you like to submit your information to the website? And do stay tuned for more information and updates!